"This recipe is designed to be inexpensive while still tasting good. My family would usually eat stew once per week. This is a recipe I developed myself over time, it reminds me of eating supper on Sunday night with my family. This is an adaptation of Irish stew made with lamb. In Ireland lamb was cheap, and in Canada beef is much cheaper than lamb. I'm aware of a French Canadian version that uses pork. Serve with bread." Cut any excess fat from the beef, reserving about 2 tablespoons of fat. Place the fat into a large pot over low heat, and cook, stirring occasionally, until the liquid fat renders out, about 15 minutes. Remove and discard any solid bits that remain. Place the beef into the hot melted beef fat, and brown on all sides over medium heat, stirring often, about 10 minutes. Cook until nearly all the beef juices have evaporated and begun to brown. Stir in the onion, and cook and stir until the onion starts to become translucent, about 2 minutes. Stir in potatoes, carrots, and turnip, and sprinkle on the flour in several batches, cooking and stirring to coat the ingredients with flour. Stir in the garlic, and cook and stir the meat and vegetables for about 2 minutes to remove any raw flour taste. In a saucepan over medium-low heat, mix the beef stock and vegetable stock together, and heat until hot but not boiling. Pour the stock mixture, Irish stout beer, barley, thyme, bay leaves, salt, and pepper over the beef and vegetables and stir to dissolve any brown flavor bits from the bottom of the pot. Bring the stew to a boil, reduce heat, cover the pot, and simmer until the meat is very tender, about 2 hours. Stir every 30 minutes, and check seasoning after 1 hour of cooking time. The cover can be removed in the last 30 minutes if you want a thicker stew. For beef fat, substitute 2 tablespoons of bacon drippings or olive oil. Instead of barley, substitute dry vegetable soup mix (split peas, lentils, and beans). 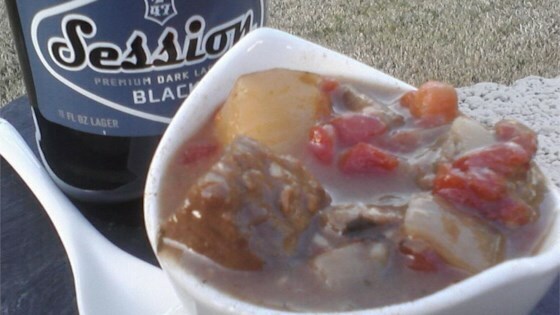 Do not substitute wine or lager for Irish stout beer; use 1 1/2 cups of additional vegetable stock instead. This is a wonderful stew. It is worth the extra trouble of going finding the beer. It has a flavor that only alcohol can do for a dish. Will make again. Hearty and healthy but oh-so-bland. If you like the taste of dark beer, this recipe is for you. Best Irish stew with Guinness beer I've eaten. I made this for a ski party and it was a hit with everyone. It had rich, hearty taste. I would recommend it. Didn't use veggie stock, used water and a bullion cube (what I had on hand). I used a regular dark lager (also on hand) and put it all in the crockpot on low. Exactly how I like my stew! My family loved this stew! I didn't have the turnips, but it turned out great without. Followed the recipe and it was perfect. Thank you for sharing!